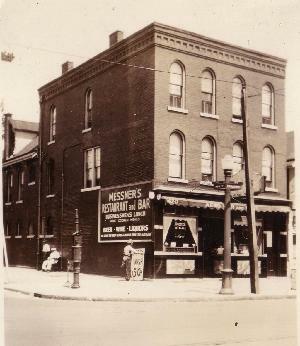 The photos show the exterior in the late 1930s and the interior bar photos show Bill and Andrew with their cook Annie Graff. The restaurant was famous for its Beef on Wick for many years. The Iroquois Brewery was across the street, and many of its employees had lunch at the Aero Bar in the 30�&40�s. Bill Messner also had a night club on Saturday nights in the back of the Restaurant with a full band and entertainment. He lived above the business with his wife Ruby from 1937 until 1945. Their two daughters, Toni and Barbara were born there. Bill Messner was in the Navy in 1944, and upon his discharge in 1945, he moved his family to Wanakah NY and sold the business and opened �The Hitching Post� at Big Tree and South Park , which he ran it until 1960 when he retired to Homestead, Fl. He died in 1982, His wife Ruby died in 1987. The Hitching Post burned to the ground in the 1990s. Forgotten Buffalo would like to thank members of the Messner family for providing us with the photos and historical write up.